Millions of birds are killed each year flying into windows. Those which aren't killed outright become easy prey for domestic and wild animals before they can rest and regain flight. Most window strikes occur when birds see trees and surrounding scenery reflected in windows. Often these reflections appear dark. That is why white static cling designs interspersed on windows (as shown in photo) are highly effective in breaking up the reflections so birds can see something there and avoid hitting the window. Decals can be placed on the inside or outside of windows. Outside they may show up better at certain times of the day. Inside they show up almost as well but stay clean, last longer and are safer to apply. 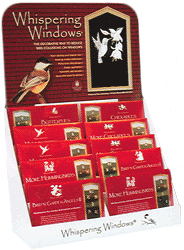 Whispering Windows are available at many backyard birding stores, garden centers and online. A few example designs are below. Actual decals are white with clear backing, they are displayed with a red background for easier viewing online.